This week I am back to working on the Jeweled Forest. This is a pattern in McCalls Quilting Magazine from December 2009. It is entirely paper pieced and is going together pretty quickly. I have just a couple of sections completed so far. It is a small quilt, only 22x37, which is nice after the last couple of big quilts that I have finished. What is on your Design Wall this week? Check out all the other projects at Patchwork Times. Have a great week and hope you get in lots of sewing time! Oooh! I put a post-it on that page in my copy of the magazine. That was how many years ago? Haven't started it....your version is lovely! Love the trees, darn, wish they weren't paper pieced lol. I guess my eyes are going on me, have a hard time reading the cursive white on pink. What is next on your list? I made this quilt several years ago in bright jewel colors, with metallic neutrals in the background... it turned out gorgeous!!! I actually won Best of Show with it at our Oktoberfest that year! It was such a fun quilt to work on - I know you are going to love it!!! 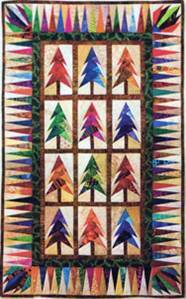 What a beautiful quilt and the trees are awesome!